From the beginning of the game one of the more interesting aspects was the positioning of United’s nominal right back; Timothy Fosu-Mensah. He was seen acting primarily in the right half space both out of possession and when United had the ball on the left side appearing as a third centre back or defensive midfield player. In possession he often drifted centrally and created a situational back 3 which gave United a more centrally-oriented build-up, despite an unclean structure, as opposed to circulating in unstable wide areas. 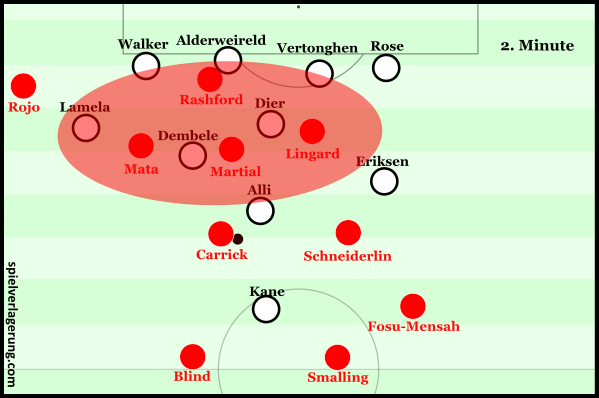 The temporary back 3 meant United could outnumber Spurs’ two forward pressing scheme without use of the midfielders who could then occupy higher positions within Tottenham’s block theoretically giving United more vertical options to progress. With Mata often on the touchline when United had the ball on the right side the passes from right back to right wing would be diagonal giving Mata the chance to receive on the half turn from where he could move infield. Eriksen could be seen defending quite centrally in reaction to his direct opponent which at times meant Mata was isolated against Danny Rose. For a player with the skill set necessary to beat opponents in such situations this movement would have been helpful. However for Mata these moments were quite unfavourable. At times Mensah would overlap Mata diagonally after passing to him thus creating space for Mata to move infield towards the half space giving United more dynamic positioning in attack. It also gave United the chance to provoke more reactions from the hosts’ defence who would have to decide quickly whether to follow their direct opponents and end up in unnatural positions or switch quickly. 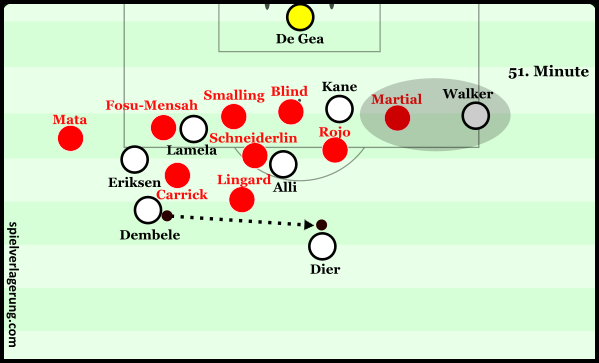 Upon turnovers Fosu-Mensah’s central positioning gave Smalling the chance to mark Kane tightly with adequate cover behind him. This was vital given that Kane’s hold up play in these situations are integral to Spurs’ counter attacks as he can retain the ball under pressure and lay it off into advancing team mates. There were also one or two situations whereby his positioning allowed him to make interceptions and prevent counter attacks due to acting in positions like a defensive midfielder as opposed to more common high and wide positioning whereby he would have to recover his position upon possession turnovers. This in addition to Mata’s variable role from a nominal right wing position meant United often had an extremely narrow shape which had some interesting effects. Offensively it gave United the potential for quick combination play due to the proximity of players to one another. United seemed keen to exploit this and attempted to force the ball into congested areas with the nearby team-mates offering an option to release the inevitable mounting pressure after a vertical progression. With Mata roaming from the right wing United’s attacks were, as usual, heavily focused on the left wing where Martial’s ability to beat an opponent and instigate quick interactions could be fully exploited. This offensive behaviour differed quite starkly to United’s usual possession game whereby fairly large distances are covered with often sub-optimal connections and the potential to switch the play and stretch an opposition defence is always maintained. 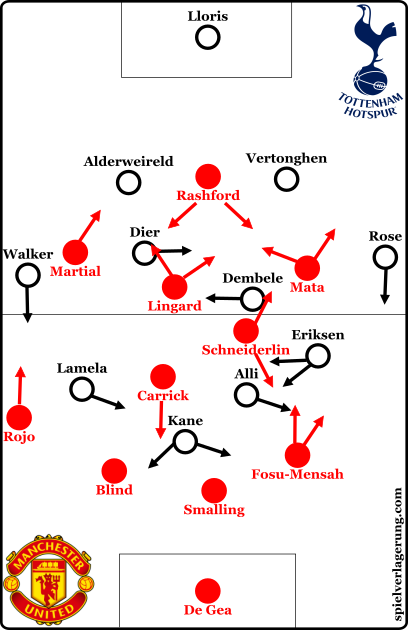 While United’s narrowness harmed their ability to switch the ball and manipulate Spurs’ defence through long shifts it gave them quite a high level of stability in defensive transitions. Counterpressing is of course easier to execute when there are shorter distances between players and a favourable numerical situation in relation to your opponents. Whilst playing directly into congested areas and combining was an atypically unstable approach for United’s possession game this was balanced out by their enhanced ability to counterpress. With at least numerical equality around the ball, United prevented counter attacks with an interesting counterpressing scheme. Upon turnovers United’s forwards would attack the ball fairly aggressively whilst aiming to cover opponents in their cover shadow, Carrick and Schneiderlin would maintain a central position remaining behind the ball, however they also pushed up to either intercept or attack recipients of vertical passes. The first layer worked well to rush the ball carrier which in turn made the jobs of the midfielders in the second layer simpler who often completed the ball recoveries. This gave United a somewhat sterile dominance of the opening exchanges and although Spurs gradually got a foothold in the game they were largely unable to expose the inherent flaws in United’s heavily man-oriented defence in the first half. 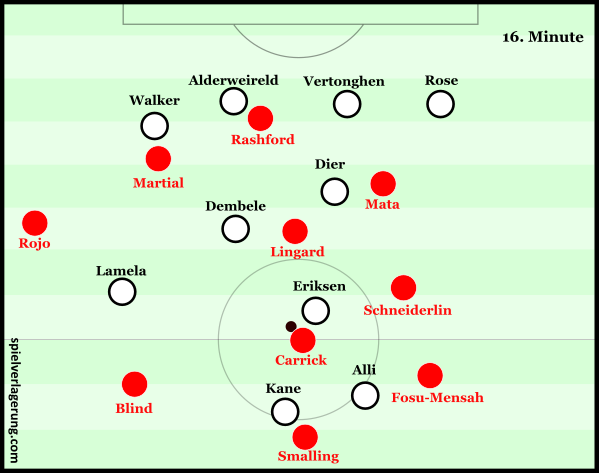 For much of the first half, and indeed the game, Spurs struggled to build-up cleanly against United’s trademark man-orientations despite having a fairly clean positional structure. In the first half they were often caught in midfield with Lingard, Schneiderlin and Carrick having strong coverage of their direct opponents and building high resistance to progressions. At other times they were forced wide and the full-backs had to drop and occupy deep positions. This was not effective for Tottenham and they were often trapped into playing long from these areas which was, of course, was not suitable for maintaining possession. With the full-backs acting deeper than usual and the team frequently losing possession Tottenham experienced suffered from a territorial disadvantage. This of course translated into difficulty in offensive transitions upon gaining possession as their deep positioning meant they lacked an out ball and they thus spent large periods of the first period within their own half. Positional rotations are of course one of the most effective methods of unsettling a man-marking scheme. Such rotations challenge the opponents to maintain coverage against a moving opponent or to regain coverage of a different nearby opponent quickly so as not to lose access and compromise the team’s efforts. In building situations Dembele, Dier and Alli/Eriksen lacked effective movement to lose their markers and their fairly static positioning made the lives of United’s man-oriented midfielders easier. Whilst they were not completely static their movements were made at a low intensity which meant it was not particularly challenging to mark them. Furthermore it gave United time to re-orient themselves in the case of their initial man moving too far out of their normal positions. Due to United’s access-creating man-orientations, practically every pass Spurs made in their build-up was made under pressure and generally they lacked individual press resistance with Van Gaal’s side generally coming on top in the duels. On the rare occasions where they managed to retain possession under pressure they could advance deep into United’s half and create potentially hazardous situations. With building through the midfield particularly difficult Spurs had to find an alternative to beat United’s press and create offensive possibilities. Pochettino instructed his full-backs to revert to a more advanced position after the interval in a bid to gain territorial dominance and provide an outlet against United’s pressure. They found some respite by drawing United in and switching to the under-loaded side where Rose or Walker were often available to receive. With United’s narrow shape in possession translating into a fairly ball-oriented shape out of it they created access fairly well but on the occasions where they did not prevent the switch they could not build access quickly on the far side due to the big distances they needed to make up. This gave Tottenham time to build attacks and the likes of Eriksen and Dembele moved to support the receiver to prevent them being isolated and to consolidate possession in these areas. When Spurs managed to consolidate possession deep into their opponents’ half United’s man-orientations were less effective and easier to manipulate. 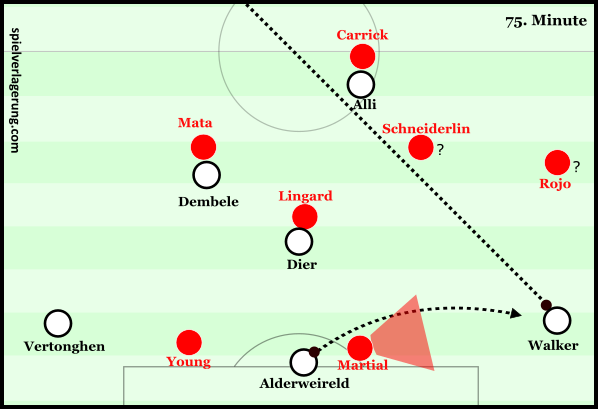 With the full-backs acting in very advanced positions United’s man-oriented wingers were at times dragged into deep and wide positions sometimes even joining the back line and creating a situational 6-chain. This was very unstable as United thus lacked control of the centre. Despite Pochettino’s men enjoying superiority in the centre in these moments they failed to fully exploit the opportunities it threw up mainly through hasty decision making. In the above situation Dier attempts a first time shot which given the distance, the goalkeeper and the sheer number of bodies in the way was not a great idea. While no options seem immediately appealing, if he took the ball forward and committed an opponent such as Rojo or Martial to come forward Kane or Walker could have become viable options in potentially dangerous positions. The aforementioned long switches being used as a means of bypassing United’s press was particularly evident in the third and final goal of the game. Spurs began their build-up right on the edge of their box with Walker positioned centrally as part of a back 3. When a team are ball-oriented and subsequently horizontally compact they need to establish access to prevent the opponents from easily exploiting the far side through switches. Perhaps through a combination of fatigue and Walker’s slightly odd positioning United failed to do so after Alderweireld’s excellent curled pass bypassed Martial’s attempt to shadow Walker. This gave Walker time to pick out a long diagonal switch from where Rose also had time to pick out a low cross which Lamela converted. This is Fosu-Mensah’s presence was missed, without wishing to overstate his influence United conceded all three goals within 10 minutes of his substitution. Part of it is due to his characteristics as Mensah is a physically imposing defender who enjoys getting tight to opponents backing his pace to recover, whilst his replacement, Darmian, excels in other aspects. Whilst the game lacked a certain level of quality this was at times due to the compactness and intensity of both sides in pressing and counterpressing situations and a low level of press resistance leading to several turnovers of possession. These elements of the game were clear in the frankly ridiculous passage of play below. Despite the margin of victory Spurs were not particularly impressive in possession or offensively and the score line flattered them to an extent. What was impressive however was their defensive resolve limiting United’s, admittedly blunt, attack to one real chance all game. Furthermore they demonstrated an impressive mentality to press home their advantage whilst United were rocking. As for United they were typically blunt offensively rarely troubling Tottenham even when they had a level of control in the first half which may prove to be a setback in their revived top four challenge. This games was awful to watch as a United fan and if it wasnt before, LVG’s writing was on the wall from this match onward. This game spelt the end of our champions league asperations and it killed any hopes of those who wanted LVG in for next season. Thank you for the wonderful insight, people do not see clearly on how the game is played, they sometimes focus too much on individuality. Interesting read. Isn’t there also a case to be made for Spurs’s lack of movement when in possession, to hold their shape for the counter press and win the ball high up the pitch. Which is how the first goal was created. I am not sure if it was poor of Tottenham or just the result of what happens when two teams overload the middle. I think for United one of the biggest issues, apart from their very obvious structural issues, is a lack of press-resistent ball carriers at #8s. Looking at their squad none of their midfielders is really capable of creating dynamics (bar Herrera who´s hardly playing) which is imo why their possession is so sterile.